I went hunting round charity shops today to find some pictures and fabric for the little man's play house. 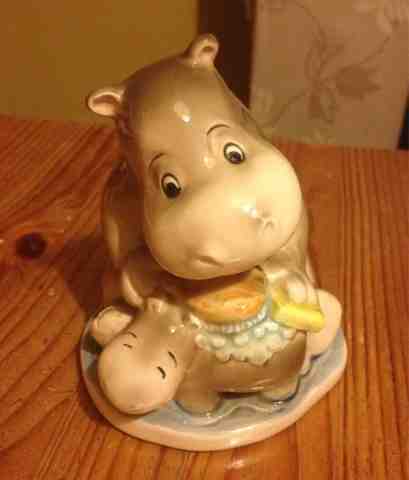 I found myself with this porcelain hippo money box in my hand. I tried at least two times to put it back on the shelf but I couldn't do it! Maybe subconsciously I think it's just like me and the pickle or something!? Anyway it's on my shelf now and for some reason I love it! The Etsy shop got off to a good start and I'm quite excited a it how it is all going. I've made a few sales but it is quite hard to get properly into it like I might if I didn't have all the other things to do!! I wouldn't change anything for the world though. The boys are happy as are we, I'm enjoying loads of hobbies now as well as the Etsy shop (pottery, netball, ukulele). 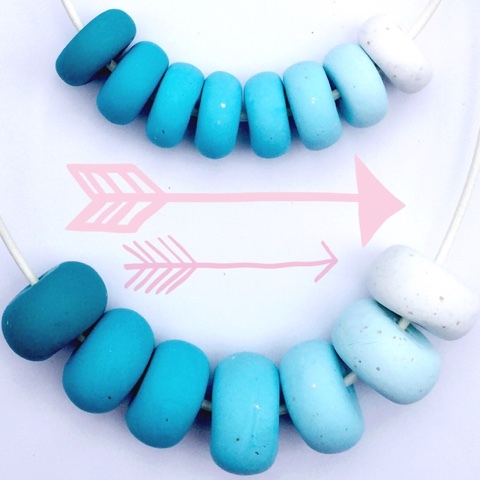 I've been reading up on Etsy tips and have made a couple of changes to the way I tag my items so we will see how that goes! Our little man Grows Wild! We've entered another competition with moneysupermarket.com which meant we got sent a free gardening kit! (Handy bag, watering can, gloves, fork, trowel and seeds!) 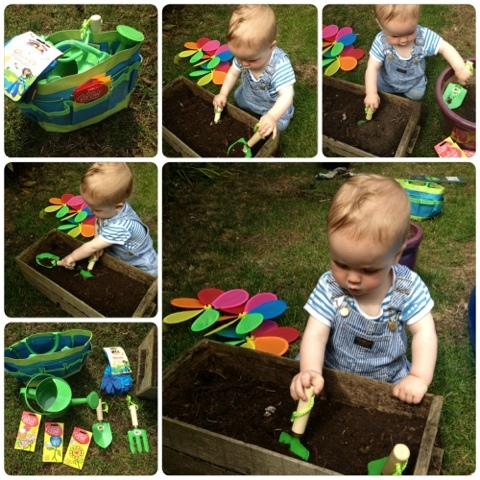 I know the little man is a bit young for really understanding gardening but he loves messy play and this was an ideal opportunity to get outside and spend some fun time together. Getting this kit provided us with a new and fun activity that we can continue with as he gets older and it meant we had some structure to our play which was really great and different (It can be hard knowing how to occupy a baby / 1 year old on your own sometimes!). Without being given this kit I don't think I would have done gardening with Jacob, I just wouldn't have thought of it on my own. So I really enjoyed this one and the pickle did too! First we found and cleaned an old planter that had been neglected then we had fun digging around in the soil and getting it ready for the seeds. It's been nearly a year since I last posted on the blog so thought a little update might be in order. Samuel is now nearly 18 months old and is running around (and falling over), chatting with new words everyday (my favourite it when he says eeese /please and akooo/thank you and nose!) and is very affectionate and loves cuddles. He is forming good relationships and enjoys seeing different people. My mum and dad look after him 2 days a week and he has a real soft spot for his 'Pop' which is so lovely to see. Samuel plays at Jacob's playgroup 3 times a week and is starting to hold his own with other children. He's not really a baby anymore but he will always be my little baby. He is cute beyond words and so loving.